Christie Rampone is an American professional soccer defender. She is the former captain of the United States women's national soccer team. Pearce has played in five FIFA Women's World Cup finals and four Olympics women's football tournaments. She is a 1999 and 2015 FIFA Women's World Cup champion, and a three-time gold medalist having won championship titles at the 2004 Athens Olympics, 2008 Beijing Olympics and 2012 London Olympics. 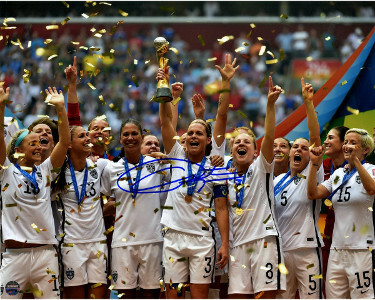 Christie Rampone has hand signed this Team USA 2015 Women's World Cup Soccer Final Champions Celebration 16x20 Photo. Steiner Sports Hologram and Certificate of Authenticity.